I made it my business to attend a Westminster gathering where the NFU stressed the importance of food security and the need to back British farming following the EU referendum result. It was a great opportunity to talk about the future of farming outside the EU. Farmers work incredibly hard to produce high-quality food and manage our beautiful countryside and they need assurances that the UK government will provide them with the support they need to increase competitiveness, profitability and productivity as we move forward. 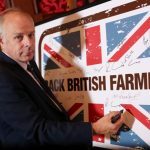 The NFU’s post-referendum pledge to Back British Farming is something I was delighted to sign and I will do all I can to ensure that we build a domestic agricultural policy which is adapted to our needs, easy to understand and simple to administer.